So, if you’ve been looking for a sturdy electric jack hammer, then you’re in luck with Makita. The Makita HM1211B promises lots of power, ease of use and dependability, but of course this isn’t the only product to make that claim, so is it any good? 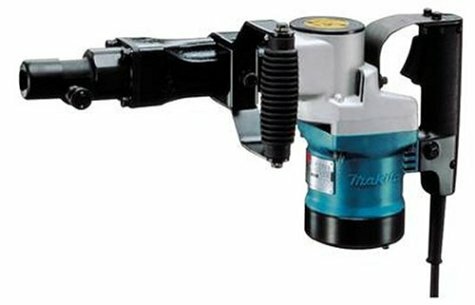 Is the Makita the kind of demolition hammer you need? We decided to check it out. The Makita runs on a 10 amp motor, suitable for light and medium duty jobs. The motor delivers up to 2000 BPM, giving you enough power to handle an assortment of jobs. The Makita has a D-shape handle. Made of rubber, it is non-slip and works as a shock absorber. You can secure the handle in multiple positions for enhanced security. The Makita demo hammer has been greased so you don’t have to do a lot of maintenance work. The commutator is protected by its automatic brush cut off, prolonging its life. Like other Makita demo hammers, the tool has the Motor Advantage engineering with copper commutator bars. Its steel laminations interlock, and along with its other features improve energy efficiency. The Makita has AC/DC support so you will be able to use this with other power sources. The Makita demo hammer has a one-touch bit retainer so you can quickly change the bits. The tool sports a D-shaped rubber grip handle, giving you a comfortable grip. The handle serves as a shock absorber so you don’t feel any vibrations. The handle also absorbs vibrations. You can also adjust the Makita in different positions so you’ll feel more comfortable using it. The Makita is also air cushioned, allowing it to deliver lots of power. The Makita electric jack hammer impacts deliver up to 2000 BPMs, The Makita is a little on the heavy side but it’s not a big deal. The combination of its impact energy, BPM and the 10 amp motor means it’s more than capable of handling light to medium stocks. The Makita works great as it is, but you can put attachments on it to increase functionality. You could for instance, place a spade attachment on the demolition hammer to increase its functionality. For lighter jobs, breaking walls and floors, the Makita performs very well. You can break concrete, brick and other materials with consistent results. The tool is balanced and has more power than other tools of its kind. Most people will use the Makita to chip concrete, and it works well. It breaks material up faster than other demo hammers, but it does not compromise when it comes to comfort. The tool is also effective for soil digging when you garden. If you spend a lot of time planting and working with soil, you will find this tool useful. A durable case is provided so you can bring the tool with you. If you’re going to use this tool for work, the solid case will be useful. The Makita is the kind of demolition hammer for users of different levels of experience. Do you need a demo hammer that makes it easy to change bits? That’s what you get with the Makita as it just takes a few seconds. The Makita is also for those who need a demo hammer with lots of power and balance. At 10 amps, there’s enough power here for most light and medium duty work. It may not be sufficient for continuous heavy-duty use, but for most users the Makita is more than enough. The tool is also for those who want an ergonomic, comfortable demo hammer. Yes, the Makita is a little heavier than other demo hammers, but it doesn’t wear you out. As you break concrete and other materials, the Makita D-shaped side handle absorbs the vibration and shocks. You should buy the Makita if you need a tool to complement your heavy-duty jackhammer. The Makita may not be as light as other demolition hammers, but it is still lighter than a jackhammer. If you’re looking for a long-lasting demo hammer, the Makita is one that you’ll want to check out. With its metal housing and powerful motor, you can use this for extended periods without fatigue becoming a factor. The factory pre-greasing means it does not need as much maintenance as other products. If you’ve had enough of high maintenance demolition hammers, the Makita is going to fit the bill. The Makita is a powerful demolition hammer, offering a nice blend of versatility, consistency and reliability. There are a lot of quality demolition hammers from Makita, but the 20 pound HM1211B is one that lives up to the hype, and we have no hesitations whatsoever in giving it a firm recommendation!